First Time Blonde Highlights-This beautiful young lady called and booked an appointment for Blonde Highlights. She is in her teens and had never had any type of hair color applied to her hair. We all agreed the results were stunning!! 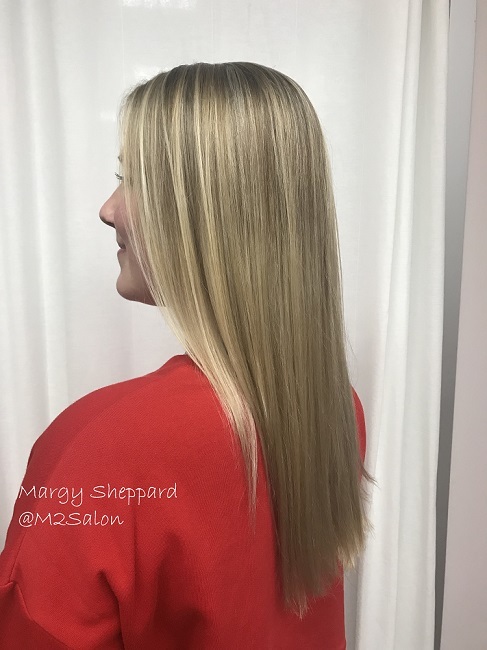 Margy Sheppard, Owner and Hairstylist at M2Salon in Morrisville, NC., is a hair color expert. She has been asked to color correct many a hair color disaster. 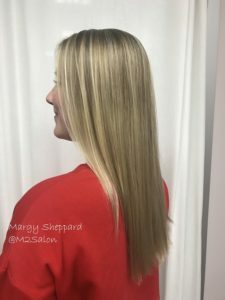 She strongly encourages anyone wanting to try blonde highlights for the first time, to do some homework on great hair color photos on Google and then contact a reputable hair salon. Margy takes appointments both online, email and via phone. M2 Salon is located in the Sola Salon Building: Studio 113, 1901 NW Cary Parkway, Morrisville, NC 27560. Email: margyfinegan@me.com or call 919-257-9007. Online scheduling on this site’s APPOINTMENTS page is available.